This is the one thousandth blog post. 1000 posts and now nearly five and a half years of blogging too. Time flies when you're having fun typing and photographing and everything else that goes along with blogging. Nostalgia aside, I've got a lot of love for weekly lists and just list-type blog posts in general at the moment. Whilst I'm a bit reluctant to commit to this weekly, expect to see this little round-up monthly. Without further ado, here's five things that are on my radar. Clothing, podcasts...y'know what, just scroll down and keep reading. Alexa Chung: My all-time muse released her first collection under her own label in a church last Wednesday evening. I woke up early to watch the live-stream and it was worth it just to hear the children's choir singing Good Vibrations, yet alone the clothes. I love it all. I want to get my mitts on a lot of the items. At the moment though I am seriously lusting after the Star Loafers, this shirt which I am kindasortamaybe considering as a birthday present to me from me and these earrings. The whole collection is just brilliant and obviously I'm insanely biased but I love it and think y'all should go cast your eyes over it here. 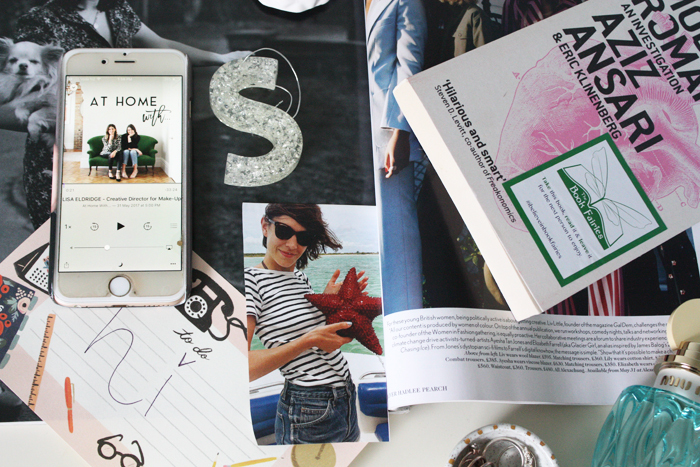 At Home With: Podcasts are certainly still having their moment and the latest I've subscribed to and love is this gem, created by Anna and Lily. They go inside the homes of inspiring women and talk to them about their spaces, their careers and a bit of everything really. My favourite episode so far has to be the one with Lisa Eldridge. Not only is she a kiwi expat but she's one of my absolute idols so hearing her share her wisdom was always going to be a treat. That and her home looks so dreamy. Further proof of that here. The Book Fairies in Auckland: You might've heard about The Book Fairy initiative over on Emma Watson's platforms. The gist of it is you leave a book somewhere, preferably with a sticker for someone else to find. You can personalise it and leave a handwritten note inside too as I have done. Anyway, from June 6th-17th in Auckland, the No. 1 Cafe will have its caravan turned in to a Pop-Up library. There'll be plenty of book fairy books waiting there and I'm going to be dropping some off this week too. Stop by for a coffee and a book. The People vs. OJ Simpson: So I might just be the last person to watch this show, also known as American Crime Story. After reading Caitlyn Jenner's book recently though, in which she mentions OJ Simpson briefly I was reminded that it was something I want to watch. For sure, some of the Kardashian scenes might be fabricated but on the whole I'm finding it makes for really compelling watching. The way in which the whole circus leading up to the trial, which is where I'm up to at the moment seems to mirror what happens now in the press, albeit on a smaller scale is quite eerie. Not to mention the sexism surrounding Marcia Clark, portrayed by Sarah Paulson. Highly recommend you watch it though if you're yet to see it. It's on Netflix here in NZ. Auckland Fair: One of my favourite events in Auckland is back for one last hurrah on June 18th. Jess Whiting has been the brainchild behind this brilliant showcase of all things handmade for the past eight years and is moving on to more exciting projects. Having been at many of the first fairs and being on the door at one back in the day at Aotea Centre, I know just how much of a labour of love it is for all involved. It'll be sad to see it go but I can't wait to see what Jess does next. I'll be there, wallet in hand to support some local makers and of course Jess. It's $6 entry and on from 10.30am-5.00pm at Shed 10 here in Auckland. -I hope you enjoy this post! Let me know in the comments what you've been loving recently.